Below are 1 - 10 of the 10 items	sorted in "A-Z by Title" order. The 201 of containing in the book Aramaic ostraca dating 361-311 BC are almost exclusive source for the study of the ethnic structure and the economic life for end of the Persian rule in the Land of Israel and the beginning of the Hellenistic period. A most enjoyable and informative book. . . an excellent introduction to epigraphy and paleography of ancient Semitic languages . . . contains a wealth of information compiled into a simple to understand format. 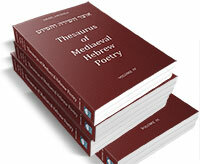 This is the largest compilation of grammatical material for Hebrew Bible. Electronic edition of one of the most influential books ever written about the Bible; S.R. Driver's meticulously detailed reconstruction and analysis of Samuel has remained vital for over a century. The volume offers a fresh analysis of a central problem of comparative Ugaritic Biblical scholarship: the relationship between biblical psalms and Canaanite literature. The twenty-two articles in this collection represent the latest results of the research into Mishnaic Hebrew that is conducted in Israel. If you work with the Hebrew verbal system, this is a book you *must* have read. Lists 35,000 poems and prayers culled from printed and manuscript sources (many from Cairo Genizah) and their variations, i.e. almost every Hebrew poem and its variations composed after canonization of the Hebrew Bible until 18th c.e.... with listings of sacred poetry reaching into the 20th century.